Ahmed and I went to Morocco for our honeymoon after our fairytale wedding. Our first stop was Casablanca. We only spent a few hours here because it is an urban city and we wanted more of a cultural feel for our trip. The main reason for our stop was the Hassan II Mosque, a beautiful house of worship right on the Atlantic Ocean and to my delight right by a lighthouse. We took a train into the city from the international airport and then a cab to the mosque. You can easily spend over a hour exploring the 22 acre space. The best part of our excursion was seeing the mosaic was used on our wedding invitation! Christina and I found it off of a google search and had no idea where it was from. It was a great way to start our trip. Marrakech was completely different from Casablanca. It was full of history and life and you could instantly tell it was the most important of the imperial cities. We stayed in a local riad within the medina so we could walk to the markets and the sights. The souks were unlike any other I have ever seen, filled with spices, leather, glass and pottery. Medersa Ben Youssef was our favorite sight because of its tranquility. It was simply beautiful and calming in a way that was very spiritual. There are a lot of old palaces in Marrekech and after a while they lose their appeal but the Medersa was unlike any other place. The Djemma el-Fna should be visited once during the day and once in the evening to understand the stark transformation. During the day, it is a mostly empty square that connects with all the souks but in the evening it is a market of its own with hundreds of food stalls and street performers. Other highlights were the Maison De La Photographie and Majorelle Gardens. Both provide a modern take on Moroccan history. Fez was very similar to Marrakech but much slower and had more of an artsy feel.We saw an Oud for the first time and Ahmed got some lessons and fell in love so much so that he bought one for himself. 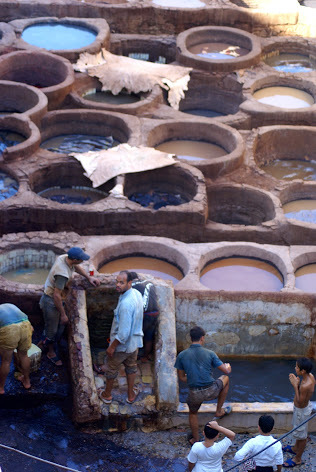 We visited the tanneries and they are quite an experience mainly because the stench is so strong. We couldn't believe the workers become accustomed to it. It was amazing to see nonetheless! We also probably had one our favorite meals in Fez. We arrived starving and tired and ventured into the souks and one of the shopkeepers tried to sell us some carpets and we told him we need food first. So what did he do? Just happened to know the owner of a local restaurant that was closed for the afternoon. He told the owner we are his dear friends and translated the menu for us and left. We ended up eating in a palace, just the two of us! And the meal was amazing! And very affordable. We did go back and buy a small carpet to show our gratitude. Our last and favorite city was Chefchaouen. Its walls were painted blue by the Jewish refugees in the 1930s and the tradition was kept alive even after the Jews left. It is a very small town about four hours north from Fez. We spent a day here just walking around and enjoying the sights and sounds by the main square. At night, we went the roof of our hotel and gazed at a sky full of stars. It was perfect. The food in Morocco is exquisite. No matter where you go, you will get some olives and bread as starters and the olives were pretty much amazing everywhere. Tagines are famous all over the country and these are stews made with vegetables and either lamb, chicken, seafood or beef. We tried them all and loved them all. Moroccans themselves are very sincere and helpful and made our trip better than it would have been without their help. Next up Costa Rica in 2 days!